Originally formed as a men’s chorus in 1945 from the rank and file of The U.S. Army Air Forces Band, the Singing Sergeants became the first premier military chorus to integrate women in 1973. Today, the group’s members often perform for the Department of Defense and other high-level military and civilian functions, using music to bridge language and cultural differences and helping advance positive diplomatic relations through song. The chorus is regularly featured at regional and national music education conferences, including the American Choral Directors Association, the Music Educators National Conference and Chorus America. At varied venues, the Singing Sergeants reach a diverse audience with the beauty and power of music. 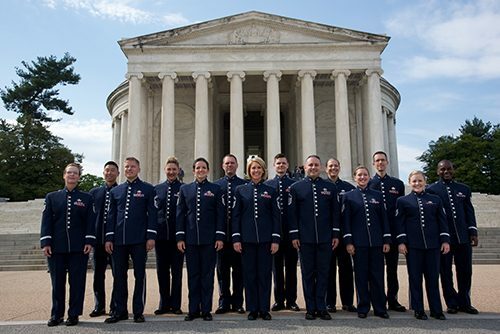 As part of The U.S. Air Force Band, the Singing Sergeants honors those who have served, inspires American citizens to heightened patriotism and service, and positively impacts the global community on behalf of the U.S. Air Force and the United States. The excellence demonstrated by these Airmen musicians is a reflection of the excellence displayed by Airmen stationed around the globe. Each member is proud to represent all Airmen, whose selfless service and sacrifices ensure the freedoms we enjoy as citizens of the United States of America.